This is the second group to be returned to the wild since the species was listed as Extinct in the Wild on the IUCN Red List in 2000. 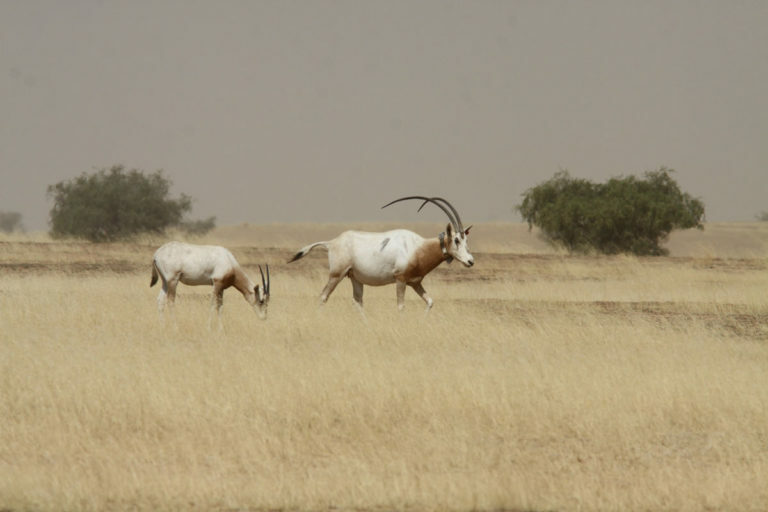 Eight female and six male scimitar-horned oryx were released on January 21 in the hopes that they would join the herd of 21 oryx that were reintroduced to Chad’s Ouadi Rimé-Ouadi Achim Reserve on August 14, 2016. The initial group of oryx — 13 females and 8 males — have reportedly thrived in their new habitat. In fact, on September 21, 2016, the herd welcomed what is believed to be the first scimitar-horned oryx born in the wild in more than 20 years. Conservationists are celebrating the successful reintroduction of an iconic antelope species, the scimitar-horned oryx, to a portion of its historical range on the edge of the Sahara desert after 14 captive-bred animals were released in a remote region of Chad. This is the second group to be returned to the wild since the species was listed as Extinct in the Wild on the IUCN Red List in 2000. “Overhunting and habitat loss, including competition with domestic livestock, have been reported as the main reasons for the extinction of the wild population of Scimitar-horned Oryx,” according to the IUCN. 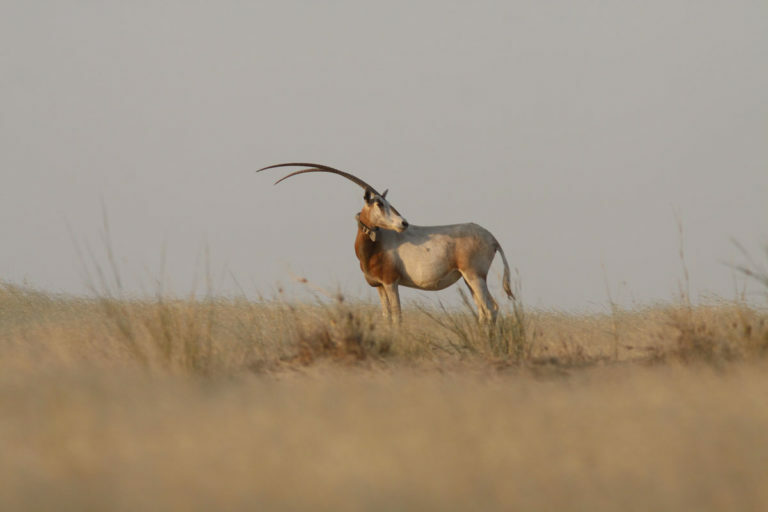 Eight female and six male scimitar-horned oryx were released on January 21 in the hopes that they would join the herd of 21 oryx that were reintroduced to Chad’s Ouadi Rimé-Ouadi Achim Reserve on August 14, 2016. 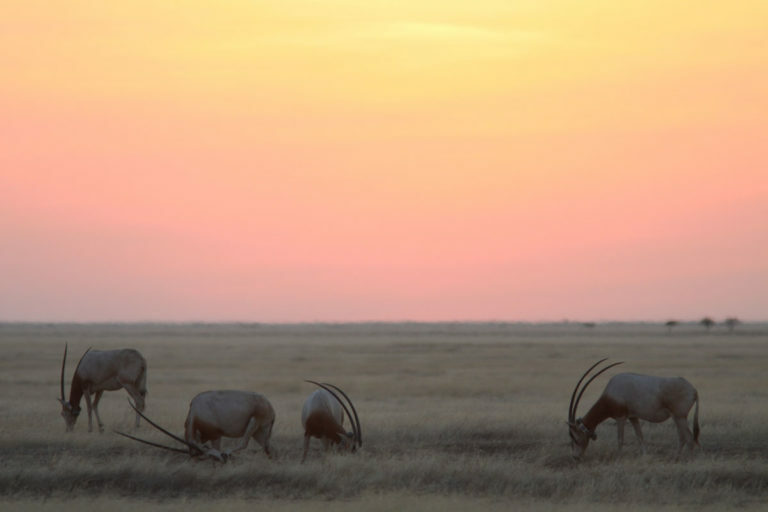 The initial group of oryx — 13 females and 8 males — have reportedly thrived in their new habitat. In fact, on September 21, 2016, the herd welcomed what is believed to be the first scimitar-horned oryx born in the wild in more than 20 years. A scimitar-horned oryx released in Chad’s Ouadi Rimé-Ouadi Achim Reserve in January 2017. © ZSL. The oryx released last August, during the wet season, became completely independent right away and ignored the supplementary food and water available to them at the release site. 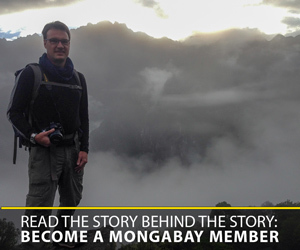 “They have put on weight and muscle since arriving and at the time of writing look in excellent condition,” Wacher said. The newly released oryx are also all in “very good condition,” Wacher added, though they were released during the dry season and, because the extensive green grazing that was enjoyed by their predecessors was not available to them, they are making more use of the supplementary food. Wacher said that this was to be expected, and their reliance on the supplementary food should reduce as the rainy season arrives. The scimitar-horned oryx (Oryx dammah) was once widespread across the southern Sahara, but was driven to extinction during a period of extended civil unrest throughout the region in the 1980s and ‘90s. A captive breeding program designed to restore the antelope species to its former habitat in Ouadi Rimé-Ouadi Achim Reserve was undertaken as a joint initiative by the government of Chad and the Environment Agency of Abu Dhabi (EAD), with key support provided by global partners such as ZSL. For instance, two female oryx from the herd kept at ZSL’s Whipsnade Zoo were transferred to Abu Dhabi in 2014 to help EAD breed a representative ‘world herd,’ the descendants of which will be part of the reintroduction program. Mother and calf scimitar-horned oryx in Chad’s Ouadi Rimé-Ouadi Achim Reserve. The mother was pregnant at the time of release in August 2016. © ZSL. 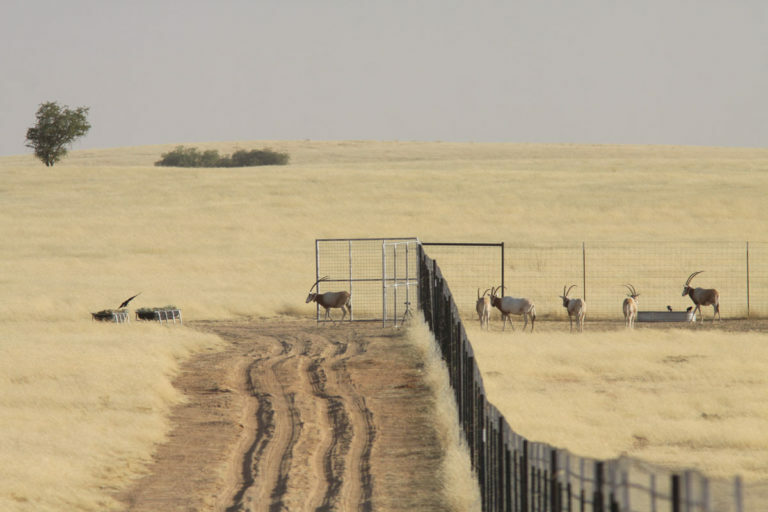 Each individual oryx released in the 78,000-square-kilometer (more than 30,000-square-mile) reserve is fitted with a GPS-enabled satellite collar to allow conservationists to monitor their movements. Another 37 oryx are in pre-release enclosures right now; the plan is to release them this coming August. First oryx leaving the enclosure. 21 January 2017. © ZSL. Scimitar-horned oryx released in Chad’s Ouadi Rimé-Ouadi Achim Reserve in January 2017. © ZSL. IUCN SSC Antelope Specialist Group. 2016. Oryx dammah. The IUCN Red List of Threatened Species 2016: e.T15568A50191470. doi:10.2305/IUCN.UK.2016-2.RLTS.T15568A50191470.en. Downloaded on 20 February 2017.